Was Abraham Lincoln the iconic "Great Emancipator" who freed the slaves and held the United States together by the force of his political will? Or was he a monster who violated the Constitution, suspended habeas corpus and made thousands of people "political prisoners", laid economic waste to the South and killed hundreds of thousands in an unnecessary War, and single-handedly changed the face of American government into something the Founding Fathers had not contemplated? Modern views of the Civil War hold that it was about nothing more than freeing the slaves. Yet even Lincoln himself once said if he could preserve the Union and not free a single slave, he would do so. What exactly was it that made this nation do the unthinkable and divide, and fight a bloody War over whether or not the Union would be preserved? Why would thousands on non-slaveholding Southerners fight, and die for the Cause of the Confederacy? Was it the oppressive tariffs imposed by a northern-dominated Congress on the South? Or was it that Lincoln, in the aftermath of his 1858 "House Divided" speech, posed a grave threat to Southern beliefs about states' rights, self-governance and the intended meaning of the Constitution? May 15-17, 2009, in Lewisburg, WV, you will have an unparalleled opportunity to both challenge and pay tribute to the story of Abraham Lincoln. As seen through the eyes of "Lee's Lieutenants" Abraham Lincoln, Federal generals and others you will hear the views, memories, and opinions of those who were leaders of the respective sides, and who fought the War for Freedom, or for Union. You will be able to meet, discuss issues with, and question these personas in a close and comfortable setting on the grounds of Greenbrier Community College, and in the streets of Lewisburg. For anyone with even a passing interest in this era that so powerfully shaped our nation, you will find this to be a fresh, eye-opening, and not-to-be-missed event. 10 a.m. – Meet the Confederate Generals. General Robert E. Lee and his Lieutenants including Generals Jackson, Longstreet, Pickett, Early and Armistead will give their perspectives on President Lincoln. 11 a.m. – Meet the Union Generals – General U.S. Grant,, his chief of staff, General Rawlings, Generals Buford and Averell and Colonel George Crook, victor in the Battle of Lewisburg, will give their perspectives on President Lincoln. 12 noon – President Abraham Lincoln on his political difficulties with Copperheads, Southern sympathizers in the North and draft riots in New York. 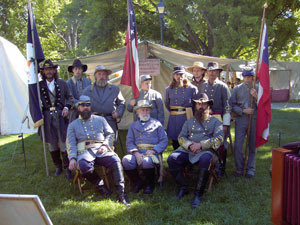 The Battle of Lewisburg Living History & Reenactment has been selected by the Southeast Tourism Society as one of the top 20 events for May 2009. For more information contact the Greenbrier County CVB 1-800-833-2068 or www.battleoflewisburg.org.